Welcome back to a new season of anime settings and background art! As with the previous season, I’ve decided not to single out any series for detailed analysis each week. With one exception, which I’ll talk about below, the lineup this spring is fairly minimalist with regard to settings. Media and general interest, and reports on pilgrimage activity will continue as always. Over the past few months, there has been a steep rise in the frequency and depth of reporting on seichijunrei, and I’ve enjoyed using more time to summarize the key points in these pieces. If something particularly notable and exceptional arises in a particular show, I may include a special section to cover it. Sarazanmai (MAPPA, Lapin Track) is intimately tied to its setting of Asakusa, along the Sumida River in Taitō Ward, Tokyo. Lynzee Loveridge has written a terrific introduction to the folklore elements, their specific connection to Asakusa, and the incorporation of both in the series. This is the latest work by writer and director Ikuhara Kunihiko, known for dense symbolism and relentless, over-the-top action in service of critical social commentary. I appreciated his previous series, Yurikuma Arashi, and know from that experience that my personal preference is to let the work wash over me as a whole, rather than pick apart the use of specific locations. But given the easy accessibility of Asakusa and its abundance of resources for tourists, this work creates a good opportunity for casual pilgrimage. Several butaitanbou-sha have already investigated locations from the first episode. Fruits Basket (2019) (TMS Entertainment and subsidiary 8PAN) included detailed depiction of a neighborhood in Denenchōfu, Ōta Ward, Tokyo in the first episode, and I had hoped there would be more like that. Briefly asking around revealed the original 2001 series, from which the remake appears to be recreating nearly cut-by-cut, did not particularly emphasize settings. Since the school that was used as a location model has already been demolished, it doesn’t seem there will ultimately be much to explore. 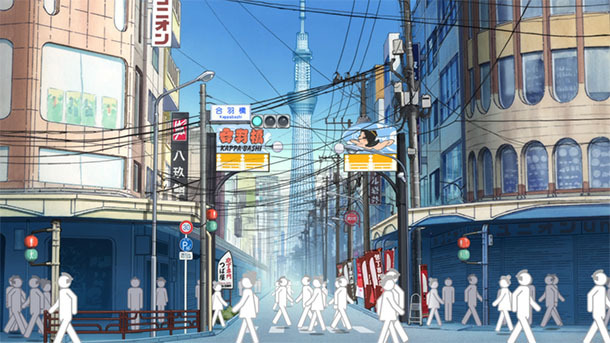 Senryū Shōjo (Connect) is a 13 minute short that, based on the manga source and scenes in the ending credits, has potential to include many locations around Tokyo Metropolis, with emphasis on Kichijōji in Musashino. There may also be appearances of Yokohama, Kanagawa Prefecture; Itō, Shizuoka Prefecture; and Kyoto. Sewayaki Kitsune no Senko-san (Doga Kobo) includes brief cuts of Toyosu Park and Toyosu Station in Kōtō Ward, and Hōya Station in Nishitokyo (all Tokyo Metropolis). Mayonaka no Occult Kōmuin (Liden Films) includes scenes in Shinjuku Ward, Tokyo Metropolis. Hitori Bocchi no Marumaru Seikatsu (C2C) may, based on the manga, include a trip to Ueno, Tokyo, but appears to have an otherwise generic setting. Midara na Ao-chan wa Benkyō ga Dekinai (Silver Link) is another 13 minute short, and includes a scene at Kita-Kamakura Station in Kamakura, Kanagawa Prefecture. Yatogame-chan Kansatsu Nikki (Saetta) is a four minute short billed as an introduction to Nagoya sights and culture. It seems preoccupied with making fun of local stereotypes and accents. Each year, fans of Hanasaku Iroha gather for a day of cherry blossom viewing and barbecue at Nishigishi Station in Nanao, Ishikawa Prefecture, the location used as the model for the series’ Yunosagi Station. The name of the event (緒花見会) is a play on protagonist Ohana (緒花) and hanami (花見 flower viewing). Though P.A.Works is often involved with local revitalization efforts in rural communities depicted in its works, Ohanamikai has always been a fan initiated and organized event. Beyond marking the years since the well-loved series originally aired, there is usually a restorative activity, such as litter pickup, integrated into each meeting. This year, attendees planted cherry tree saplings, adding to the stock of blossoms for future generations of anime pilgrims to enjoy. Sakuragaike Fire Festival was held April 13 in Nanto, Toyama Prefecture to mark the (almost) one year anniversary since the planting of the first cherry tree sapling by Sakuragaike Quest (桜ヶ池クエスト), an organization that aims to revitalize the area around Sakuragaike, the lake near the P.A.Works studio. Sakuragaike Quest was formed as a response to P.A.Works series Sakura Quest, with the primary goal of fundraising for tree planting in the area to create the dense clusters of cherry blossoms depicted in the fictional work, which modeled its setting on multiple areas in Nanto. P.A.Works president Horikawa Kenji serves on the Sakuragaike Quest board as chairman of the executive committee and was in attendance at the Fire Festival (back row center in the first image below). Danro published an article introducing “seichijunrei producer” Kakizaki Shundō (柿崎俊道) and discussing his writing and distribution strategy for self-published periodical Seichikaigi (聖地会議), which explores anime tourism from the perspectives of academia, government and business. Kyoto Shimbun published an article about the upcoming mayoral election in Toyosato, Shiga Prefecture, which will ask about, among other questions included on the ballot, residents views on strategies for better utilizing the former Toyosato Elementary School, the town’s most popular tourist site and setting of anime series K-On! @tianlangxing made a pilgrimage to Kappabashi and Asakusa, Taitō Ward; Mukōjima, Sumida Ward (all Tokyo Metropolis) for Sarazanmai Episode 1. @Roan_Inish made a pilgrimage to Kappabashi and Asakusa, Taitō Ward, Tokyo Metropolis for Sarazanmai Episode 1. @flyingbird1124 made a pilgrimage to Hamamatsuchō and Kaigan, Minato Ward, Tokyo Metropolis for Kaguya-sama wa Kokurasetai: Tensai-tachi no Ren’ai Zunōsen. @ad_motsu made a cherry blossom pilgrimage to Izu Kōgen, Itō, Shizuoka Prefecture for Amanchu! @Bf109K1 made a cherry blossom pilgrimage to Shioiri, Yokosuka, Kanagawa Prefecture for Tamayura: Hitotose. @fragments_sue made a pilgrimage to Yokohama, Kanagawa Prefecture; Shibuya Ward, Nakano Ward and Kunitachi, Tokyo Metropolis; Fukuoka City, Fukuoka Prefecture for Kaitō Saint Tail.